ACG’s Professional Services division supports our clients with long-term highly skilled professionals or quick turn-around temporary staffing to meet project deadlines. ACG Professional Services help find the right talent at the right time. Arlington Consultants Group (ACG) provides quality & reliable staff augmentation services. 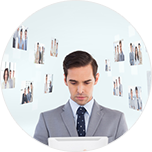 We work closely with our clients in creating customized plans to identify their talent needs. ACG’s recruiting process utilizes our in-house talent database, our vast social & talent network, and online resume searching tools to find an optimal resource to meet your project needs. ACG’s quick turnaround to find a potential candidate allows our clients to gain utilization, while maximize their revenue. This allows for steady completion of projects with minimal disruption from normal staff attrition. Throughout the process, we work closely with our clients to ensure that we are able to engage the right talent at the right time.